You know the old saying; you only get one chance to make a first impression. Well as it turns out that saying is true, and just thinking about it brings back awkward memories of high school, my first date, and freshman orientation. If you can relate to what I am saying then you know that awkward first impressions are usually caused by the simple mistakes we make. It is not until we step back and take a look at the big picture, that we realize that these errors are easily avoidable. In the world of internet marketing first impressions last about 30 seconds and users can be a little more judgmental than your first teenage crush. In fact most people that visit your website will decide if they are going to stay or leave and go back to the search results within 3-5 seconds. This is what most marketers call the “Blink Test” and whether you pass or fail is often determined by the quality of the photos on your website. If you are an avid reader of our blog, you know that the crew here at ICND has been hard at work pushing out new websites every month. With each new site we like test user engagement to see where we can make improvements. Since we live at the beach, and because summer is almost upon us, we decided to take a deeper look at some of our Vacation rental websites. We started off by selecting a handful of sites that we have an established relationship with & we know like the back of our hand. Each website is in the vacation rental industry, they all offer summer vacation rentals in coastal communities, & each site has a property listing search engine. Some of the websites used professional photos for their property listings; some used photos that were taking by the business owners, & others used a mix of both. For two weeks we tracked which pages users visited the most and where they clicked on those pages. Using Google analytics we were to record how visitors found each website, what page they landed on and how they moved the site as they found content they enjoyed. We also used Visual Website Optimizer, by Wingify, an A/B testing software that has a number of tools like behavior targeting, usability testing, and most importantly heat maps. 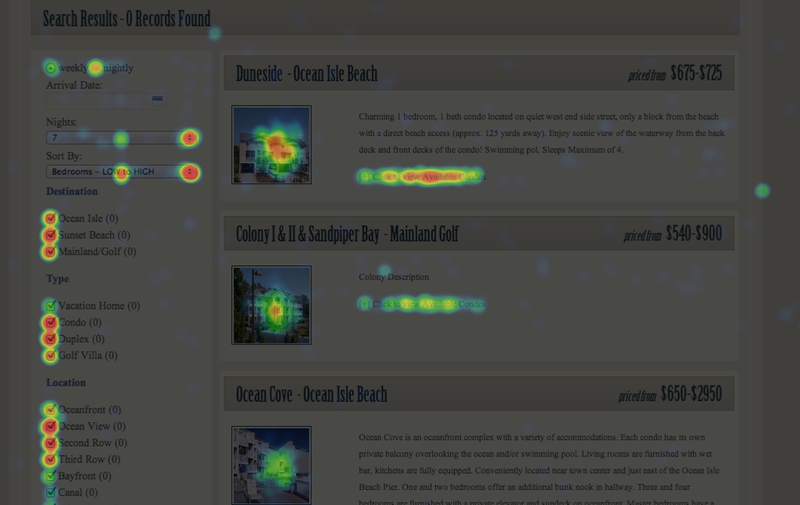 With the heat maps we were able to create a visual representation of what each visitor clicked on every page they visited. As we dug into the data and looked at the heat maps it became clear that people love photos. Pages with bright colorful professional photographs kept people’s attention much longer than pages with no images. We also saw a very high image click through rate on pages where you could click on an image that opened another page. 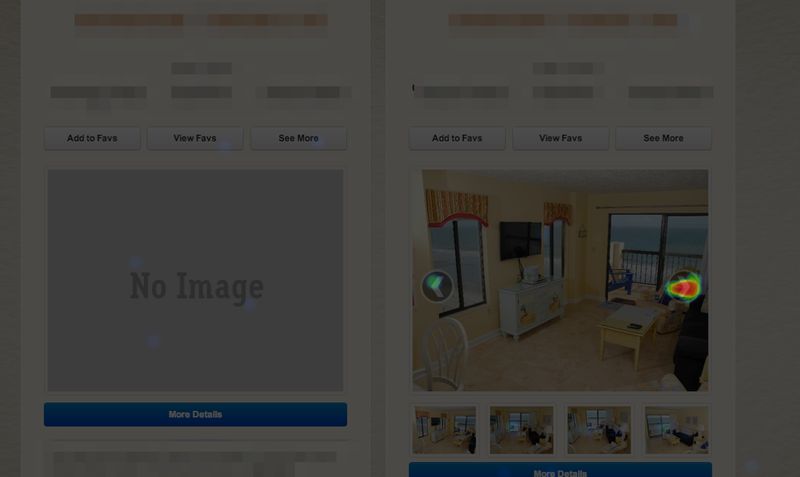 In fact visitors seem to ignore the top navigation if there was beautiful photo of a property they could click on. When we compared the number of clicks between property listings that used professional photographs versus the properties that used their own photos, studies (via Flipkey) have shown a 159% increase in traffic for listings that used professional photographs. It also increases the bookings of properties less $200 per night by 98% according to the same study. Even properties that are located within the larger well established resorts that we all know by name, did not fare as well as a small private property that had a better presentation. I personally find this very exciting as both as a marketer and as someone that makes multiple purchases online every week. This study hints to the fact that while the big brands of the Vacation Rental Industry have the advantages of a larger marketing budget and a larger list of current clients, smaller brands can actually compete online if they present their properties in way that is pleasing to consumers. • Hire a professional photographer to take your shots. • Sit down and a have meeting with your photographer to plan out what kind of photos you want to showcase your listing. • Think about when you should schedule your photo shoot. If you are marketing to Summer Vacationers, it may not be a good idea to shoot in the Fall when the leaves are Orange and the Grass is brown. • Only showcase your properties best amenities. Make sure to include photos of the main living areas, kitchen, bedrooms, and baths, renters love to see what they are getting. 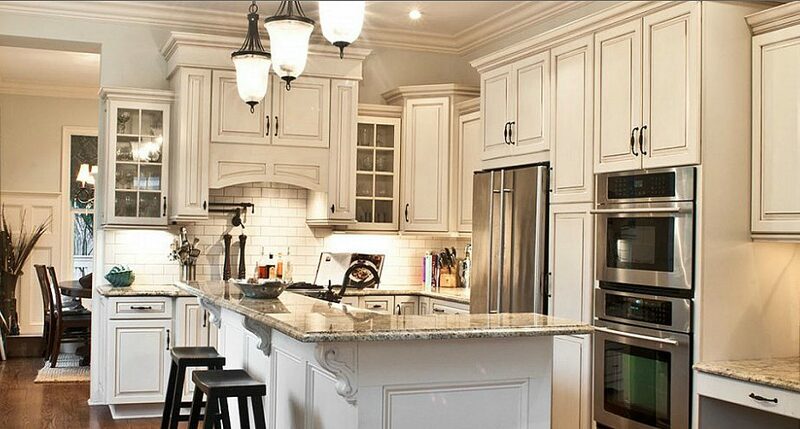 However photos of linen cabinets and extra closet space can cause buyers to lose interest. • Lastly include a few photos of the beach, mountain side, or lake that your property is close to. While most large rental sites already have images to represent your area users like to see the exact location of where they are staying. Have questions or comments? We’d love to hear your feedback on Twitter, Facebook.